The last week has been intense... and this is just the beginning. An employee of french tv TF1 has been fired for expressing anti-HADOPI opinions in a private e-mail sent to his MP . 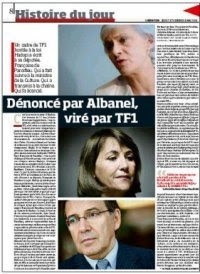 The story was revealed yesterday by french newspaper Libération (see image on the left : "Denounced by Albanel [french Minister of Culture], fired by TF1". Please join the support group on Facebook. Yesterday also, the lower chamber of French Parliament (the "Assemblée Nationale") completed the initial reading of the so-called HADOPI law. Despite the beautiful resistance of a handful of MPs (Patrick Bloche, Christian Paul, Jean-Pierre Brard, Martine Billard, Jean-Yves Le Bouillonnec and a few others), the law will be voted on May 12 in its original repressive form, without any amendment. It will then move to the upper chamber (the "Sénat"). All this happened while the European Parliament saved Amendment 138 (again! ), in a thrilling twist of manoeuvers and counter-manoeuvers not seen since "The Usual Suspects" ! This is a very strong message sent to the french governement. Things may also get quite tense between France and other member states, as the complete Telecom Package is now stuck and delayed only because of Amendment 138. Commissioner Reding called on the Council "to assess the situation very carefully, also in the light of the importance of the telecoms reform for the sector and for the recovery of our European economy". It's time to get involved... or you may live to regret the good old days of Internet freedom. This one took place within the traditional gathering of trade unions, political parties, etc on May 1st. Here are some pictures I took.